Interview with J.D. Feigelson: Writer of DARK NIGHT OF THE SCARECROW! A couple months back I wrote a piece regarding DARK NIGHT OF THE SCARECROW and how pleased I was that it had finally been released in digital (DVD) form (which you can read HERE). A couple weeks later, I was ecstatic when the film’s writer himself, J.D. Feigelson, commented on it. Most of the feedback we receive on TERROR FROM BEYOND THE DAVES is via Facebook or direct email. Of course we appreciate all comments but are particularly pleased when people take the time to comment directly on the blog. I was very happy that J.D. had been alerted to story and that he appeared to have liked it. I quickly wrote him back asking if he’d mind doing an interview for the site and he honored me by agreeing to do so. Below are 10 Questions for J.D. 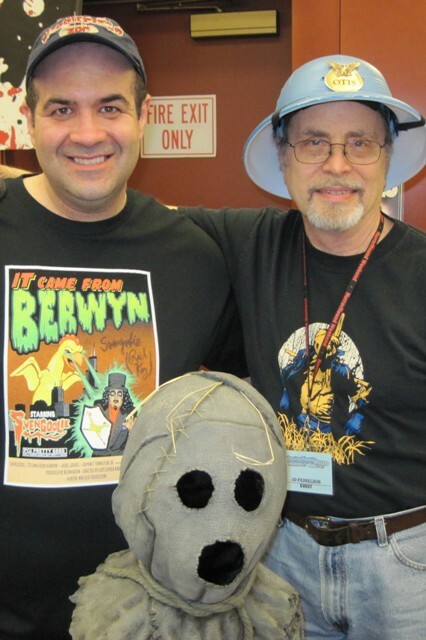 Feigelson, writer of DARK NIGHT OF THE SCARECROW! 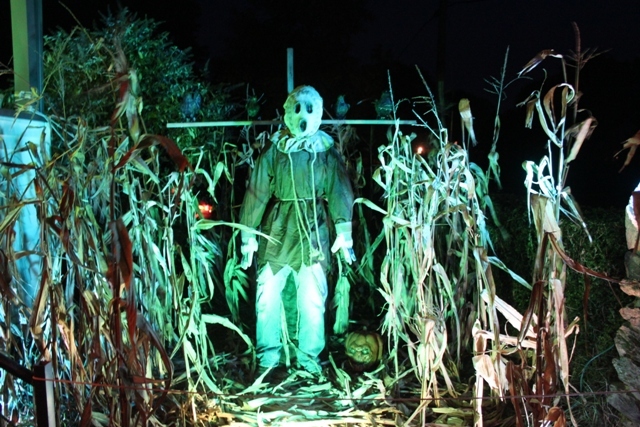 DAVE: Prior to DARK NIGHT OF THE SCARECROW, what experience had you had as a writer? J.D. : Prior to DARK NIGHT OF THE SCARECROW I had very little screenwriting experience. I had written and made a 25 minute film called “The Bowman” my last year in college and did an adaptation of a short story by author Ambrose Bierce, “one of the Missing”, which I filmed a few years later. My next attempt was a motorcycle – message feature of the “Easy Rider” genre made in 1970. I also directed this movie which had little success. Interestingly Director Tobe Hooper plays a roll in it. “One of the Missing” found a home finally on PBS in 1979. DAVE: The film has often been compared to those great “revenge from the grave” tales that were popular in EC Comics. Had you grown up a fan of those comic books? J.D. : I certainly was a fan of the EC Comics. “Vault of Horror”, “Tales from the Crypt”, etc. And I’m sure they influenced me in horror in general, but not specifically in any certain story. I would say that I was more influenced by the last days of radio drama. In particular “Inter-sanctum”. It had many stories based on the idea that the main character got away with some terrible deed and it came back to haunt him. I was also influenced by the original version of the movie – “The Thing”. DAVE: What inspired the story of DARK NIGHT OF THE SCARECROW? J.D. : The force that motivated me to do the film was two proceeding “failures”! So, I was confused and rethinking my efforts. My first love was historical drama, i.e. “The Bowman”, “One of the Missing” and later “Gone to Texas” (CBS Network). Because of the costs of doing a full scale historical drama was out of the question I fell back on my other love – horror. Lots of meditating on it and fear of another failure was a big psychological factor. 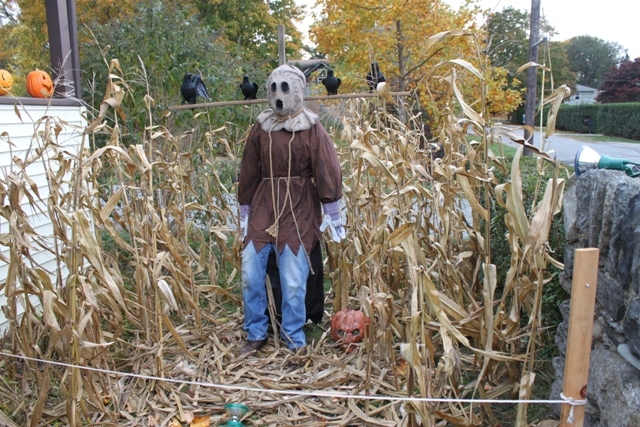 A lot of past experiences, memories and ideas finally jelled in to the idea of a horror movie with a scarecrow. My first draft was terrible. Very predictable about a young couple coming to a rural community with a ghostly scarecrow. I junked it after much agonizing. Time went by and slowly the present storyline developed in my imagination. DAVE: I, and many other fans, were thrilled to finally see this film receive the official DVD release it deserved. I know you worked very hard behind the scenes to make this happen. Can you tell us what it took to finally get this film remastered and released in digital form? J.D. : First of all I had no idea over the intervening years since it was made that DARK NIGHT OF THE SCARECROW had such a dedicated and broad following. After the original broadcast on CBS the movie had a short release on VHS for home video. It was then picked up by Warner Bros. TV distribution on a long 27 year contract. They were never interested in doing a DVD release – only syndicated television. In 2008 my partner and executive producer Joe Wizan called me to tell me that Warner’s contract had run out and that the movie was back with us. Did I think it would be ripe for DVD? I told him I thought so, but really I had no idea as to how broad and wide. So, I was tapped to produce and direct the restoration and remastering of the movie, which I did. All else has come to follow. DAVE: I really enjoyed watching the film along with yours and director, Frank De Felitta’s, commentary. One thing that struck me was how this TV movie really has the look and feel of a theatrical presentation. You mention that it was filmed using angles usually reserved for the big screen. Can you elaborate on this and why it was shot in this manner? J.D. : Rather simply Frank is a superb director. It was his idea and will to shoot the movie in a theatrical style. To this day I thank my stars for Frank’s loyalty to the script and his wonderful perception. DAVE: Charles Durning is really amazing as the contemptible Mr. Hazelrig. It was mentioned during the commentary that he wasn’t initially thrilled with this role but that “he certainly feels differently now.” Has Mr. Durning responded to the cult following this picture has garnered? J.D. : I have mentioned to Charles from time to time about how wonderful the fans think he is in DARK NIGHT OF THE SCARECROW. As you know he is a veteran of many, many movies and an Oscar nominee. He certainly is appreciative but I don’t think he is as amazed at its acceptance as I am. DAVE: Horror fans should note that you are credited with creating the very first “killer scarecrow” as the centerpiece of a movie. 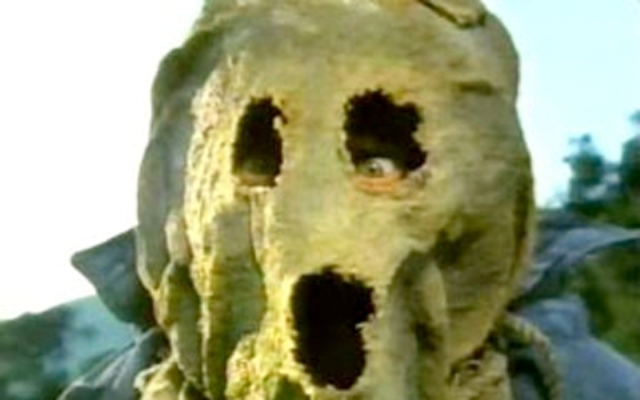 While there have been many more since I find none to be as creepy as the design used in DARK NIGHT OF THE SCARECROW. Who designed this costume? J.D. : I was informed by a film historian that it was the first feature length horror movie to have a scarecrow as it centerpiece. As my associates and I were contemplating the making of it as an independent feature, I made some preliminary sketches of how I envisioned the monster. The art director at our studio, Bill Griffin, took these sketches and rendered the scarecrow. Later when I ended up making the movie for CBS the same scarecrow was imported and starred in DARK NIGHT OF THE SCARECROW with only minor changes. 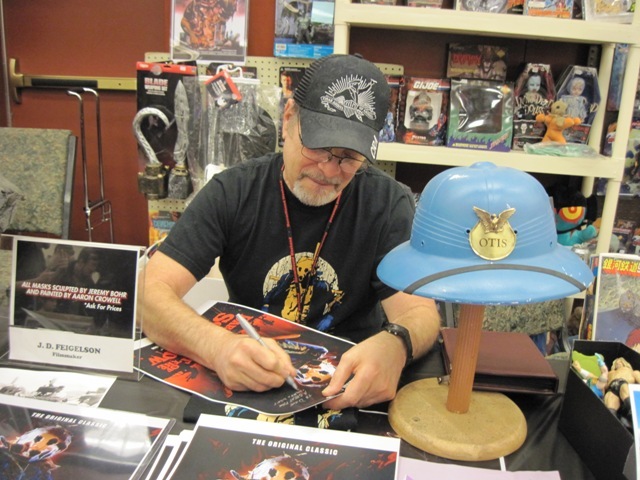 DAVE: I had the honor of meeting you at the Horrorhound Weekend in Indianapolis last March and I remember just being overwhelmed with appreciation for the impact that film had had on me. During these public appearances, were you surprised by the number of young fans who grew up influenced by your work? J.D. : I must admit that after some dozen fan conventions I am still amazed AND humbled by the huge interest and love for this film. When we made it I could not have imagined in my wildest dreams that it would be so honored. I have been introduced to a third generation of kids who have just found and love it. DAVE: How was the film received in 1981? When did you become aware that it had achieved cult status? J.D. : In 1981 when the film was telecast it was considered just another piece of TV fluff. Nothing special. It occupied two hours of TV and served the sponsors. Goodbye. The few reviews were passive. Judith Crist ended her short review with: “…who’s doing the killings?…who cares.” And that was it. Until…the mid nineties when a friend showed me a book of interviews with horror celebrities. Among them the great Vincent Price. And would you believe – he’d seen the movie and was gushing over it. That was the first good review. God bless Vince. I became aware of DOTS as a cult film during the restoration process. The word had gotten around and I began to get inquiries and then invitations to the film cons. This was before the release. Needless to say I was amazed! Can you imagine, I had no idea from 1981 to 2008. DAVE: On the short video interview found on Amazon.com, you allude to a possible sequel. Care to elaborate? J.D. : As to a sequel. There is nothing on the boards at the moment. All our time has been spent getting the DVD prepared and out. But as anyone knows from seeing the film, a sequel is certainly possible. I hope this has answered effectively all your questions. So—goood niiight. Pleasant dreams..Muuuhahahaha. This entry was posted in Big 80's Horror! and tagged CHARLES DURNING, Dark Night, EC Comics, Horrorhound, J.D. FEIGELSON, LARRY DRAKE, Revenge from the grave, Scarecrow. Bookmark the permalink. ← Thankful Beyond the Daves!